The contact center is a critical step in the ideal experience for patients and physicians. 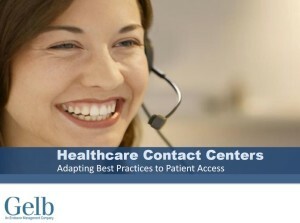 In this brief presentation, Gelb will illustrate best practices in contact centers created by national leaders in healthcare. We will examine the differences between functional needs (what must be done) and emotional needs (how patients and physicians feel about your contact center). How does your contact center rate on the 9 Dimensions of call center strategy? Does your contact center engage and enchant callers?